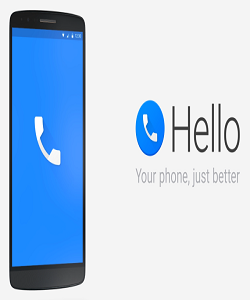 Home/News & Features/Social Media News/Facebook/Facebook Offers A New Dialer App – Hello! Google and WhatsApp were already offering the free call feature but Facebook thought of offering something even better in the form of Hello. The social network recently launched its new dialer app that offers free calls over WiFi and it has certainly irked the phone carriers all across the world. So what makes this new app special and why you may consider downloading it from the Play Store? The app makes use of Facebook’s database of user information to display who the caller is. So you will view the user name even if you don’t have them in the contacts. It’s easier with Hello to prevent unwanted people to call ring your phone. There’s a useful search feature that helps you find phone numbers of local businesses. Hello allows free calling over WiFi networks using VoIP. Facebook has been offering this feature within Messenger for some time but now it comes packaged with a dialer. Even if you have a missed call, the app will let you respond using Facebook Messenger. Caller Information – Facebook is banking on its vast user base (over 1.32 billion users) to match the phone number in an account with the incoming call. This will help you learn whoever is calling you (even if the number is stored in your contact). Howsoever good it may be, there are some limitations to this feature. It will display only that information which a user has made public on his or her profile. If the user has allowed others to find them on Facebook by their number, Hello will display their profile picture with a mini-profile on your device. You will get instant info about the caller’s hometown and any mutual friends. Once the call is disconnected, you could view more information such as email and website (if they have). Search Local Businesses – If you are in a new location and need to find the nearest restaurant, there’s no longer any need to scour TripAdvisor or Yelp. Just search on Hello and find the phone numbers of the restaurants nearest to you. The same holds for other business categories. You can not only get directions to the nearest restaurant, you could also reserve a table there. However, it’s essential that the business have a Facebook account, which most of them have these days. But it’s worth noting that Google has already been offering this feature for a long time. Besides, it’s not certain if the social site’s business database is as comprehensive and rich as Google’s. Material Design Principles – The new app complies with Material Design principles with its 4 main tabs defining all the functions. These are Contacts, Dialer, Recent calls, Settings. 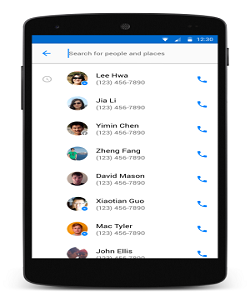 Google offered the dialer features on its Hangouts app. However, despite offering access to its powerful and rich database and Google Maps support, it couldn’t make it quite popular. On the other hand WhatsApp (also owned by Facebook) has been able to bank upon its existing presence in the instant-messaging arena to offer a more successful free dialer feature.